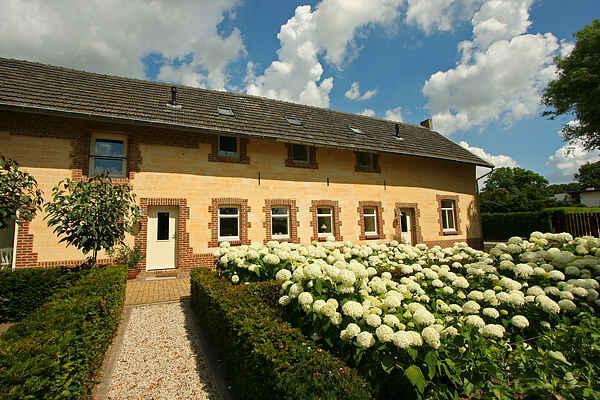 This authentic farm of 1842 is located in the pretty Geuldal, between Wijlre and Schin op Geul. The restored farmhouse houses two separate apartments, both with their own terrace providing views on the lovely Geuldal. This location is an ideal starting point for beautiful walks and cycling trips through the Geuldal and the hills. The steam train of the Zuid-Limburgse Stoomtrein Maatschappij goes through the village (at approx. 200m from the house). This location is also a perfect base for excursions to e.g. Valkenburg (5 km) with its famous caves, Thermae 2000 and casino, but also the pleasant city Maastricht, Vaals with the well-known three countries point and the historical cities Aachen en Liège.